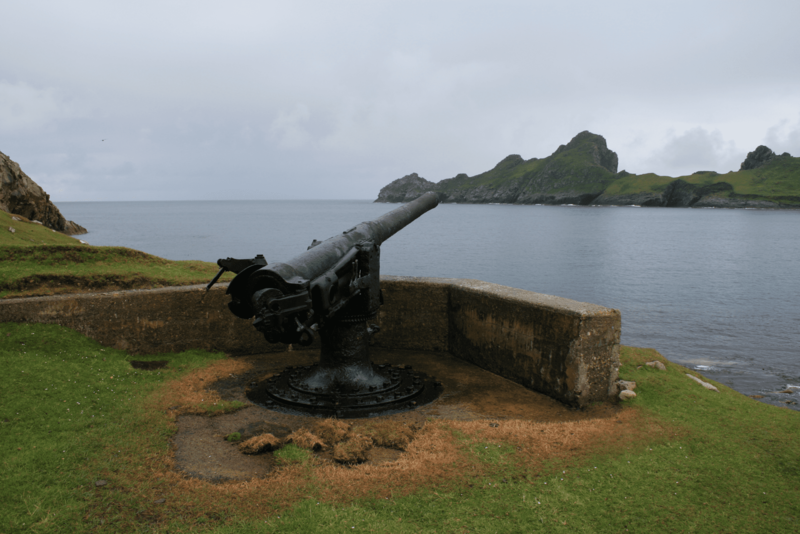 The Ministry of Defence, working with defence contractors QinetiQ and Skye-based architects Wittets, has submitted a planning application to Comhairle nan Eilean Siar for a thorough redevelopment and environmental upgrading of the 50 year-old St Kilda facility. Galliford Try International and Hugh Broughton Architects have now been appointed to develop the design using expertise gained through building similar facilities in environments with challenging climates, including work for the British Antarctic Survey. Using a light environmental touch, the new facility will be constructed on stilted foundations to minimise ground impact. The lower segments of the new buildings will be curtained with stone walls designed to blend into the St Kildan landscape as well as offering an architectural echo of the nearby abandoned cottages and cleits of Village Bay. Wood panelling over the exterior walls will attain colours through weathering that will complement the surrounding scenery and roofs will be planted with native St Kildan grasses. The redevelopment of the St Kilda station signals a continuing commitment by the Ministry of Defence to its facilities in the Western Isles, which remain of great economic importance to island communities. “We have been very impressed by the extent to which the MoD and its partners have gone to make sure they come up with proposals that will enhance the existing site and are both sympathetic and sustainable in the vitally important context of St Kilda. “Most traces of the buildings from the 1960s will be removed and their replacements will be entirely appropriate to the setting in terms of design profile and best environmental practice. “Every detail has been considered, down to ensuring that there is no chance of contaminant flora or fauna from the mainland being brought to St Kilda during the construction phase. Famously, the last resident islanders of the north Atlantic archipelago of St Kilda, some 66 kilometres away from the nearest landfall on the Scottish mainland, were evacuated in 1930 by fisheries protection vessel, HMS Harebell. In the years since, the military tracking station was established on the main St Kildan island of Hirta in 1957 in the same year that archipelago was accepted by the National Trust for Scotland, having been bequeathed by the 5th Marquess of Bute in 1956. St Kilda achieved World Heritage status for its outstanding natural heritage and was among the very first sites put forward by the UK for inscription on the World Heritage List in 1986. In 2004, the inscription was extended to include the surrounding marine environment and in 2005 the archipelago became the UK’s first and only mixed World Heritage Site, and one of only 35 worldwide, when the islands’ relict cultural landscape was also inscribed on the World Heritage List. Construction of the new MoD facility on St Kilda will take two years to complete – the rough Atlantic waters mean that there is only one short season in the summer of each year when it is possible to guarantee regular access by boat.